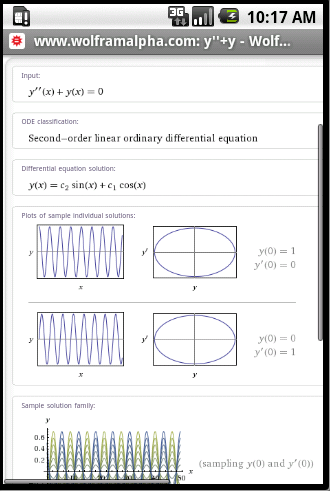 This is the third in an ongoing series of articles where I take a look at some of the mathematical applications available for iPad. Click here for part 1 and here for part 2. If you are the author of a mathematical iPad app that you’d like me to review then feel free to contact me. 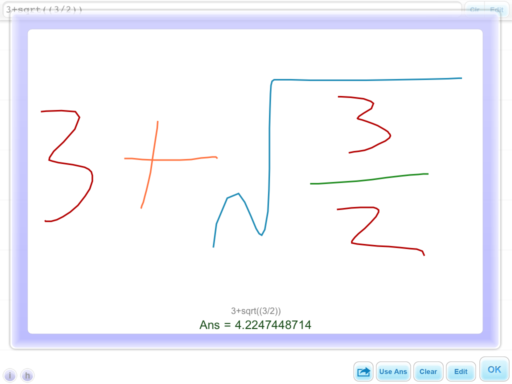 Also, if you use any mathematical iPad app regularly and think that its awesome then contact me and let me know why. All of these apps are interfaces to Wolfram Alpha, the fantastic computational engine that I fell in love with upon its release. Sadly, the apps themselves do not live up to the quality that I have come to expect from Wolfram Research and, as one iTunes reviewer put it, they are very thin-soup. In my opinion, the only one worth buying is the Wolfram Alpha app and even that is questionable since you could just access Wolfram Alpha directly (and for free) from your iPad web-browser. I’ll admit that the keyboard provided by the app is occasionally useful though. The course assistants offer no additional content compared to the Wolfram Alpha app (or the website); they simply offer a menu driven way to generate search queries that are then sent to Wolfram Alpha. I would spend my money elsewhere if I were you. In my original Math on the iPad article I focused on all singing, all dancing computer algebra apps but sometimes all you need is a good, old fashioned calculator. There are hundreds available on the appstore and slcalc is my current favourite. slcalc has got a long history for a mobile app since its first outing was on the Linux-based Sharp Zaurus back in 2003. 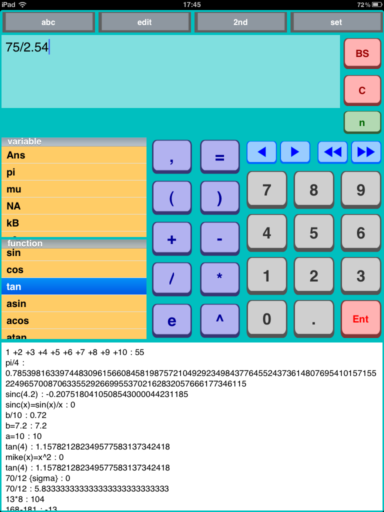 The current iPad version is great and includes a long calculation history, the ability to use variables, arbitrary precision calculation (up to 256 digits), big buttons and a reasonable set of functions. You can even program it (and here are some example programs). All this for $1.99 (there is a more limited free version also). I guess my only minus point would be that the colour scheme is a bit..um…odd! Oh, and it can’t do complex arithmetic either but they are only minor things that detract from an otherwise great app. The idea is brilliantly simple, you write the calculation that you want to perform directly onto your iPad’s screen and the iPad finds the result. No need to learn programming syntax or which button to press next, just write and calculate. Sadly, the reality isn’t quite so brilliant. There are a limited number of functions (Basic arithmetic, square root, factorial and power) and the handwriting recognition is a bit flaky although I have to admit that my handwriting is probably more of a challenge than most. I also find myself wishing that I could use a stylus to write with since using my finger just doesn’t feel as precise. Furthermore, it turns out that I can punch numbers into a traditional calculator (such as slcalc above) MUCH faster than I can write them down. 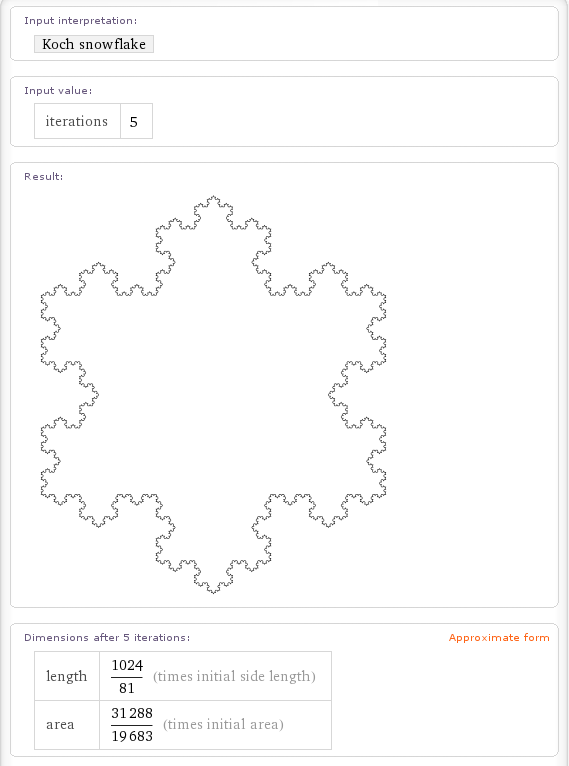 Back in May 2009, just after Wolfram Alpha was released, I had a look to see which fractals had been implemented. 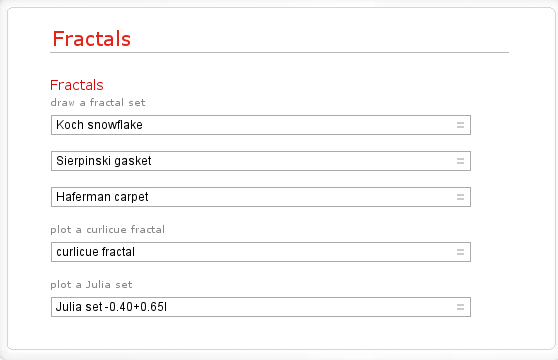 Even at that very early stage there were a lot of very nice fractals that Wolfram Alpha could generate but I managed to come up with a list of fractals that Wolfram Alpha appeared to know about but couldn’t actually render. On a whim I recently revisited that list and am very pleased to note that every single one of them has now been fully implemented! Very nice. 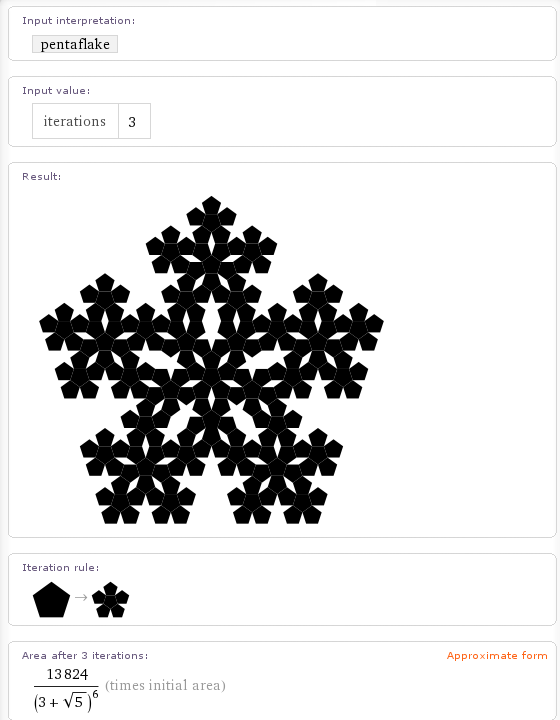 Can you find any Wolfram Alpha fractals that I missed in the original post? Should be easy huh? 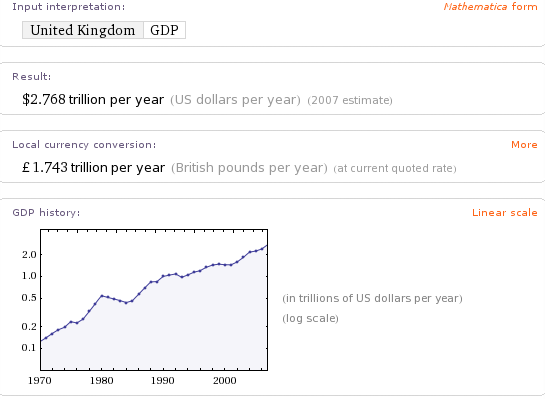 Wolfram Alpha knows all about the GDP of the UK – if I Wolf GDP UK then I get the following output among other things). Fabulous! The data is clearly in there but how do I get it out in the form I want? Let’s try the hopeful UK GDP from 1970 to 1980. Alas I get the now familiar ‘Wolfram|Alpha isn’t sure what to do with your input.’ Moving on, I tried UK GDP 1970 to 1980 and UK GDP 1970-1980 but they didn’t work either. I can get at a single datum easily enough. 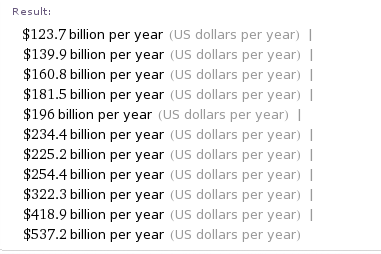 UK GDP 1970 gives me 123.7 billion for example but how do I get it to give me a list? Further experimentation showed me that I can get the GDP for any two years if I Wolf for something like (UK GDP 1970) (UK GDP 1971). I tried a LOT of different inputs but the practical upshot is that the only one that worked was (UK GDP 1970) (UK GDP 1971) (UK GDP 1972) (UK GDP 1973) (UK GDP 1974) (UK GDP 1975) (UK GDP 1976) (UK GDP 1977) (UK GDP 1978) (UK GDP 1979) (UK GDP 1980). Lord help me if I wanted three times as many data points. For the record I can get exactly what I wanted in Mathematica 7 with the following two lines of code and I worked out how to do it with a moments thought. Wolfram Alpha needs to be this easy! So, after some blood sweat and tears I had some actual numerical data but how could I export it to something useful. 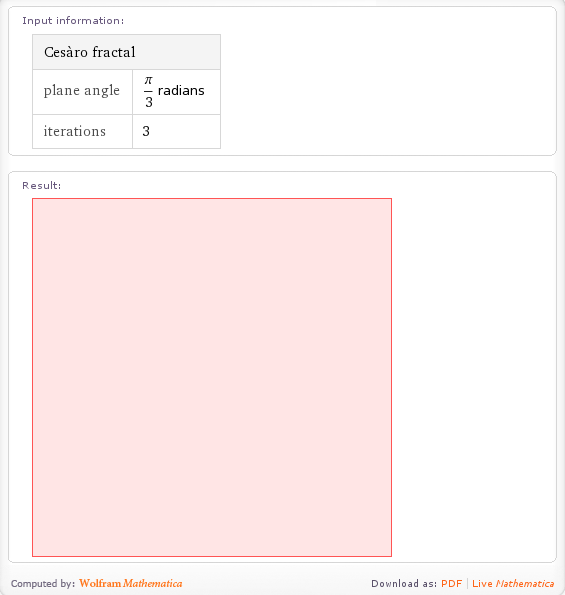 Wolfram Alpha always returns results as images by default. Hmmm. That’s going to need some pre-processing before I can import it into Excel I think – a job for a student or a Python script I think. Now onto the Source information. It listed it’s primary sources as ‘Wolfram Alpha Curated data 2009’ and ‘Wolfram Mathematica CountryData’ with a shed load of Secondary sources such as ‘The US CIA WorldFactbook’. I have to say that I was a little surprised at this – how is Wolfram Alpha the Primary source of this data set? They must have got it from somewhere and THAT somewhere would be the primary source (or closer to it at least) IMHO. In all honesty, I feel that putting itself as the primary source for data such as this is a bit like a student writing an essay and under ‘references‘ simply putting ‘My head‘. Allow export of tabular data in popular formats such as CSV and Excel. Work on the sources information a little. Wolfram Alpha didn’t actually generate this GDP data – they must have got it from somewhere and that should be listed as primary source. Wolfram Alpha is a constantly moving target and it is quite possible that all of these issues will be addressed in no time (if Wolfram agrees that they are issues of course) so feel free to point out if any of the inputs I have linked to give different results from those stated here. I am also aware that I don’t know everything about this system so if I am being an idiot then feel free to point out how I should have phrased my query. 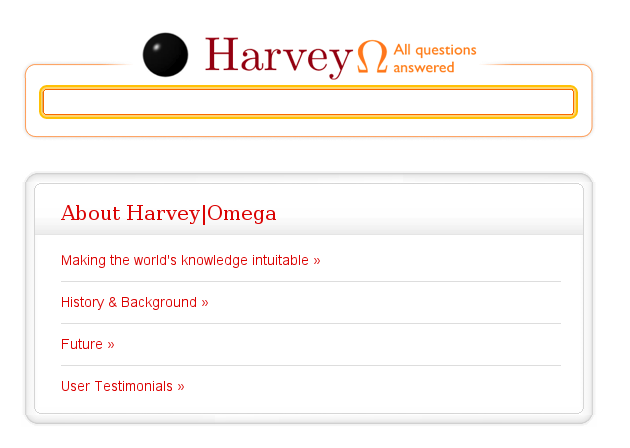 Finally, if any new functionality comes online that makes all of this trivial then I would love to know. Comments are, as always, welcomed. Use Wolfram Alpha to lose weight. 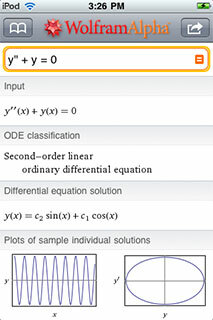 I apologise to any of my regular readers who may be tired of all of the Wolfram Alpha updates but I am pulling an all-nighter at the office and whenever I find myself waiting for my main computer to finish what it is doing, I end up feeding queries to Wolfram Alpha. 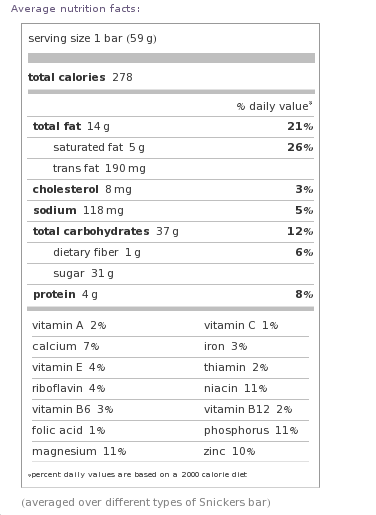 From the beginning, I knew that Wolfram Alpha knows about the calorie content of a lot of foods. If you walpha snickers bar for example you get quite a lot of information including the following. OK, so you are on a diet and you’ve just given in and eaten a snickers bar. Now you have calorie guilt and you want to know how much you have to run to burn it all off and break even. 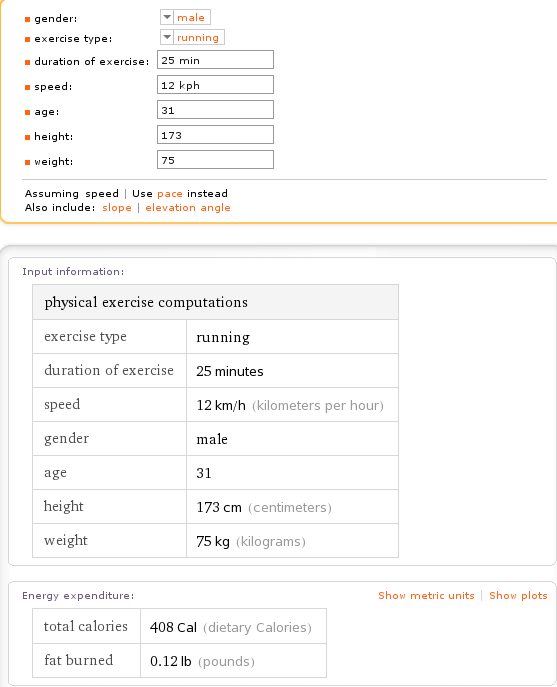 Walpha the term exercise calories burned and you’ll get quite a large set of results including a set of editable input boxes similar to the screenshot below. The input parameters refer to my run on the treadmill yesterday and I see that I burned 408 Calories according to Wolfram Alpha. Actually this is in complete agreement with the readout on the treadmill so whatever model they are using – they agree with each other. Put another way, my 5km run is worth almost one and a half snickers bars. On reflection, however, maybe I need to lay off the snickers bars because Wolfram alpha also tells me that my body mass index is a little on the high side. Ho hum…. What I find cool about these input boxes is that you can use any units you like. I used kilometers per hour but could have chosen miles per hour or a pace of 8 minutes per mile. Heck, I even put my height in parsecs and it just got on with the calculation. Wolfram Alpha also has a guess at how quickly I might run a marathon based on my current fitness using the Riegel and Cameron models. I’ve never run a marathon so couldn’t possibly comment on its accuracy. When will you be one billion seconds old? 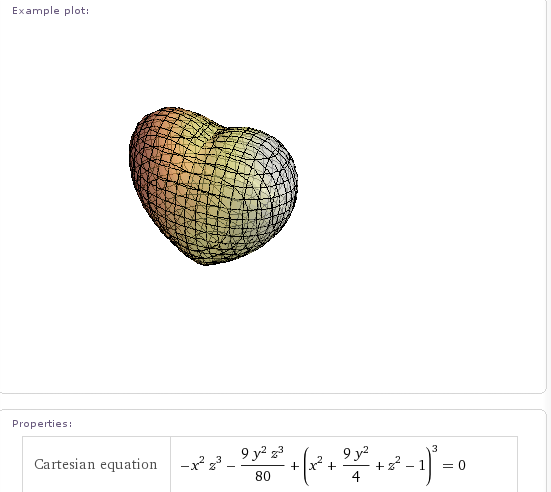 I’m going to have to try really hard to stop Walking Randomly from becoming a blog about Wolfram Alpha but I really am enjoying playing with this system. 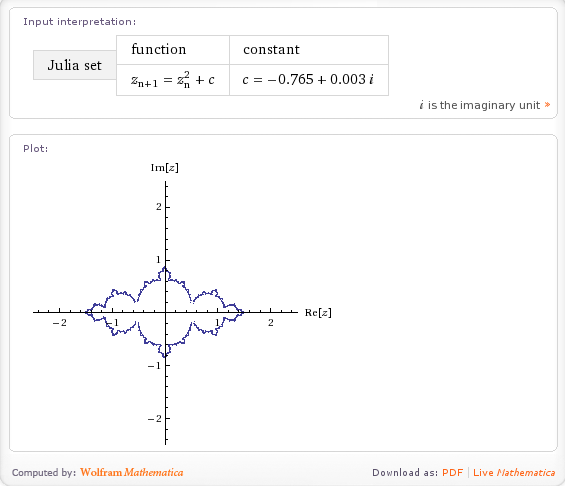 I saw a tweet from someone this morning which mentioned that you could plot the Julia Set using Wolfram Alpha. 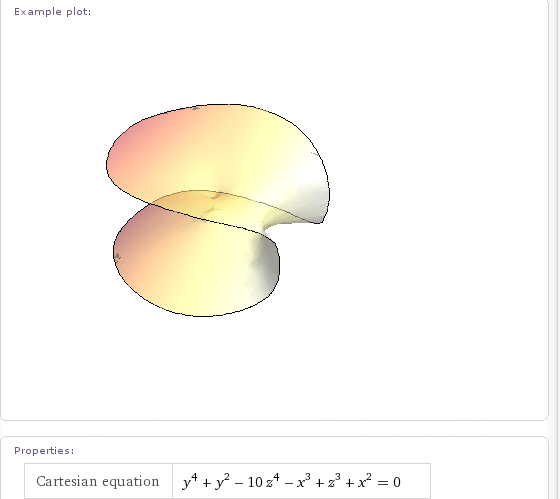 I had to try this for myself as soon as I could and, sure enough, you can plot the Julia set for any complex number Z: -0.765+0.003 I for example. Here is a screenshot for the Koch Fractal. These aren’t the only fractals it knows about though. If you walpha Pentaflake (a fractal close to my heart) then you get the following. 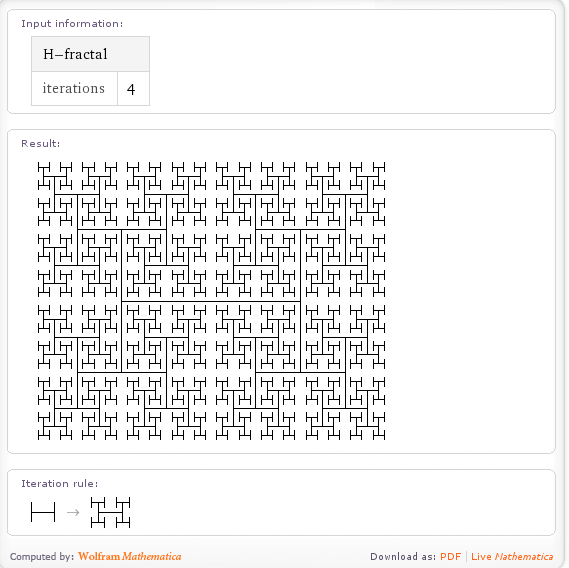 Wolfram Alpha can also calculate the H-Fractal. It also looks like they are in the middle of implementing the Cesaro fractal. 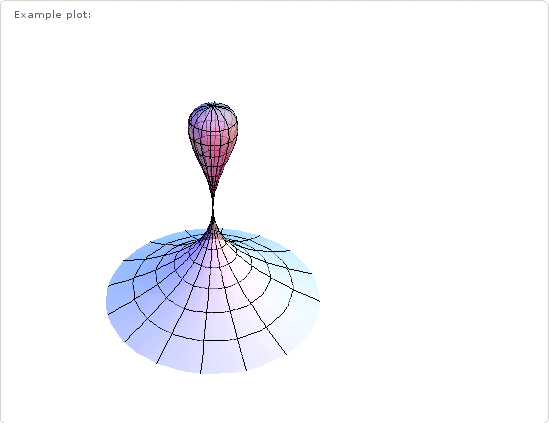 If you walpha the term then it tries to generate the fractal for a phase angle of pi/3 radians and 5 iterations. A few seconds later and the calculation times out. If you lower the number of iterations it returns a red box such as the one below. If my memory serves, Mathematica returns such a box if there is a problem with the graphics output. I hope to see this fixed soon. It also seems to know about the following fractals but doesn’t seem to calculate anything for them (yet). 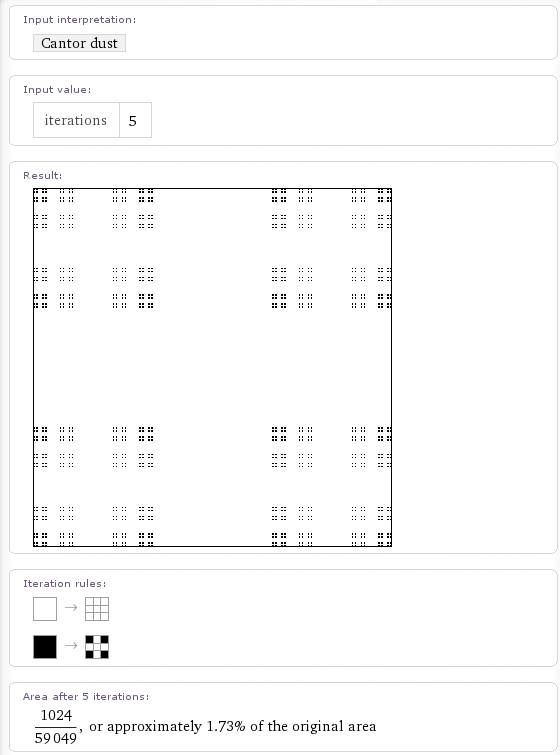 I say that it seems to know about them because it gives you an input field for ‘Iterations’ which implies that it knows that a number of iterations makes sense in this context. It’ll be cool to see all of these implemented in time. Some odd omissions (at the time of writing) are the Mandelbrot set (Update: 15th July 2009 – this has been done now) and the Lorenz attractor. 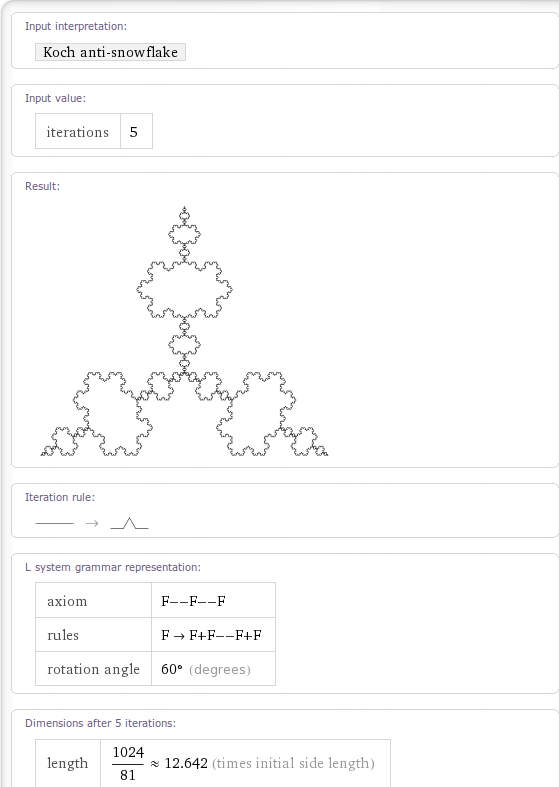 This is all seriously cool stuff for Fractal fans and shows the power of the Wolfram Alpha idea. Let me know if you discover any more Fractals that it knows about and I’ll add them here. 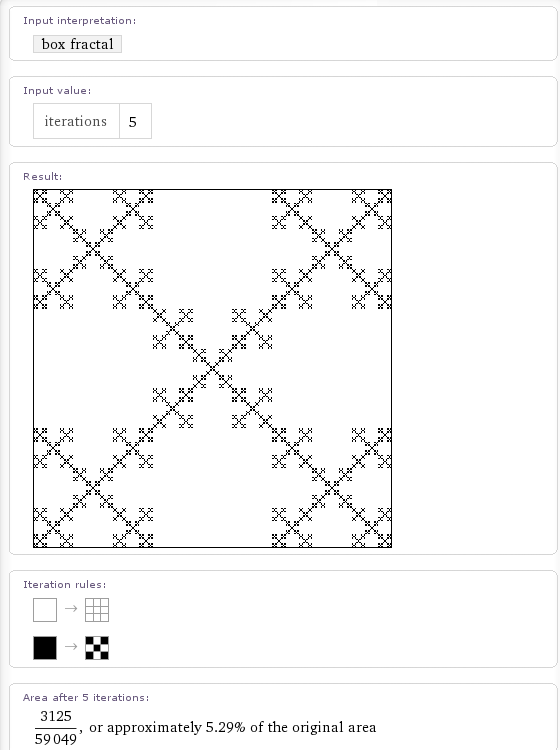 Update: I’ve found a few more computable fractals in Wolfram Alpha. Please forgive me for the lack of screenshots but this is getting to be a rather graphic-intensive post. The links will take you to a Wolfram Alpha query.